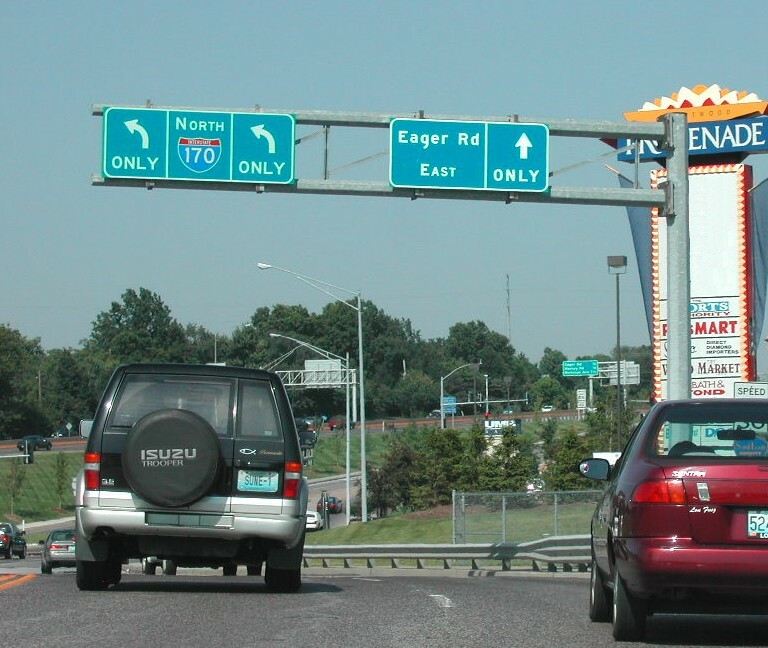 Interstate 170 is the Inner Belt Expressway in the St. Louis County, west of the city of St. Louis. This north-south freeway connects I-270 to Interstate 64 & U.S. 40 at the cities of Brentwood and Richmond Heights. The Inner Belt Expressway is heavily traveled, servicing suburban cities, St. Louis Lambert International Airport (STL) and the adjacent Boeing plant as a commuter route. Interstate 170 was originally designated as Missouri 725 when constructed during the 1960s. The route was a part of a planned inner beltway that never made it to full fruition.1 I-170 was established by AASHTO on June 29, 1978 from I-70 / Missouri 725 northward to I-270 over the newly constructed freeway. AASHTO approved the extension of Interstate 170 southward from Missouri 725 to U.S. 40 at Richmond Heights on June 25, 1979. The “New I-64” project from 2000 to 2009 included a major overhaul of the exchange joining the south end of I-170 with I-64 & U.S. 40 at Richmond Heights. The previous interchange lacked a direct connection from I-64 east to I-170 north, requiring motorists to navigate along Brentwood Boulevard to either Eagar Road or Galleria Parkway to access the Inner Belt Expressway northbound.2 A systems interchange with high speed ramps for all movements was eventually built. Eagar Road intersected the south end of Interstate 170 across from Brentwood Promenade shopping center. The connection was reconfigured into freeway exit ramps. Photo taken by Rich Piehl (12/00). Eagar Road connected with the previous south end of I-170 just east of Brentwood Boulevard. Photo taken by Brian Dowd (06/02). Interstate 170 travels through the city of Berkeley on the two mile approach to Interstate 270 Photo taken 10/16/04. Exit 9C to Hanley Road is the final mainline off-ramp from I-170 north. Traffic partitions for I-270 west to Bridgeton and east to Bellefontaine Neighbors in one mile. Photo taken 10/16/04. The Inner Belt Expressway makes an S-curve westward to flyovers for Interstate 270. Photo taken 10/16/04. An end sign appears one half mile ahead of the exchange with Interstate 270. Photo taken 10/16/04. Interstate 270 heads west 3.5 miles to Missouri 370 at Bridgeton, which provides a bypass around St. Charles. East from I-170, the outer belt continues nine miles to the Chain of Rocks Bridge across the Mississippi River. Photo taken 10/16/04. Back to back ramps depart from Interstate 270 west for Graham Road / North Hanley Road to the cities of Hazelwood and Florissant and I-170 south to STL Airport over the next mile. Photo taken 05/24/18. Reconstruction of the upcoming directional T interchange (Exit 26A) with I-170 south included realigning ramps to eliminate left exits and the construction of expanded flyovers from I-270 west to I-170 south and from I-170 north to I-270 east. Photo taken 05/24/18. A November 4, 2003 ribbon cutting ceremony on the two-lane flyover (Exit 26A) for Interstate 170 south represented completion of the interchange upgrade project at I-170/270. Additional work included expansion of I-270 across North Hanley and Graham Roads to ten overall lanes. Photo taken 05/24/18. An Arrow-Per-Lane sign replaced these overheads on I-270 west above North Hanley and Graham Roads. Photo taken by Jeff Morrison (04/19/08). Interstate 270 and U.S. 67 come together at what was a full cloverleaf interchange (Exit 25) just prior to I-170. The loop ramp for Lindbergh Boulevard north was removed by 2013. Photo taken 05/03/12. Pershall and Dunn Roads accompany Interstate 270 to the north end of I-170. No control cities are used for I-170, though the commuter freeway winds through a number of suburbs, including Overland, University City and Brentwood. Photo taken 05/03/12. Interstate 170 runs along the east side of St. Louis Lambert International Airport (STL) through Berkeley to I-70. Photo taken 05/03/12. I-170 angles southeast through Clayton, 0.75 miles ahead of Interstate 64 & U.S. 40. Succeeding lane drops occur over the next half mile for Brentwood Boulevard. Photo taken 05/04/12. Crossing over Clayton Road, Interstate 170 enters the city of Richmond Heights. The freeway proceeds south by St. Louis Galleria mall to I-64 & U.S. 40. Photo taken 05/04/12. Two lanes descend from Interstate 170’s south end to connection with Eagar Road across from The Promenade at Brentwood retail complex. The mainline continues onto flyovers for I-64 & U.S. 40. Photo taken 05/04/12. Interstate 64 extends west from the Poplar Street Bridge through St. Louis to Town and Country, Chesterfield, Weldon Spring and I-70 and U.S. 61 (Avenue of the Saints) at Wentzville. Photo taken 05/04/12. The ramps for I-64 previously separated from I-270 three quarters of a mile south of Brentwood Boulevard. They split a quarter mile further north now. Photo taken by Brian Dowd (08/23/02). The end overhead for I-170 south at the Brentwood Boulevard south off-ramp was amended from one to one half mile. Photo taken by Brian Dowd (06/02). The original traffic pattern at the south end of I-170 required all motorists headed for I-64 & U.S. 40 to move to the right lane for low speed ramps west to Ladue and east to St. Louis. Photo taken by Brian Dowd (08/23/02). An end sign for I-170 stood by the Galleria Parkway underpass. A on-ramp connected the adjacent retail area with the ending freeway here. Photo taken by Brian Dowd (07/12/02). A pedestrian overpass spanned I-170 south just ahead of the exit for Interstate 64 & U.S. 40 west to Wentzville. The freeway extended south of I-64 to an at-grade intersection with Eagar Road. Photo taken by Brian Dowd (07/12/02). Exit 1B formerly joined a c/d roadway along I-64 & U.S. 40 west through a folded diamond interchange with parallel Brentwood Boulevard. Photo taken by Brian Dowd (06/02). A loop ramp joined the ending I-170 with Interstate 64 & U.S. 40 east to Downtown St. Louis. Three lanes continued to Eagar Road and the entrance to Brentwood Promenade shopping center. Photo taken by Brian Dowd (06/02). Exit 31B partitions with Interstate 64 & U.S. 40 west to both South Hanley Road and Brentwood Boulevard for the cities of Richmond Heights and Brentwood. The freeway mainline proceeds west to the systems interchange with I-170 north. Photo taken 04/13/13. Interstate 170 (Inner Belt Expressway) begins and heads north through Clayton, University City and Overland to I-70 near St. Louis Lambert International Airport (STL). Photo taken 04/13/13. A substandard six-ramp parclo interchange previously joined I-64 & U.S. 40 with Hanley Road. Part of the New I-64 reconstruction project rebuilt this exchange into a split-diamond interchange, with frontage roads extending past I-170 to Brentwood Boulevard. Photo taken by Rich Piehl (12/00). 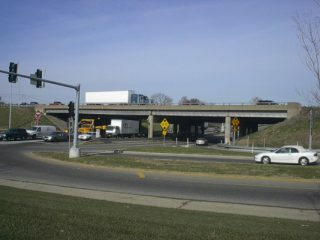 A c/d roadway connected I-64 & U.S. 40 westbound with both I-170 north to Clayton and Brentwood Boulevard to St. Louis Galleria mall. Photo taken by Brian Dowd (06/02). Interstate 64 & U.S. 40 navigate through a series of S-curves leading to the south end of I-170 at Exit 31A. Photo taken 05/24/18. The fourth eastbound lane for I-64 & U.S. 40 drops at the off-ramp for both I-170 north to Clayton and Brentwood Boulevard. Photo taken 05/24/18. Interstate 170 (Inner Belt Expressway) connects a number of St. Louis County suburbs north to I-70 by STL Airport and I-270 at Florissant. No control city is used at the south end however. Photo taken 05/24/18. Motorists bound for I-170 north, Brentwood Boulevard to St. Louis Galleria mall and Hanley Road at Brentwood and Richmond Heights depart in unison from I-64 & U.S. 40 east. Photo taken 05/24/18. Prior to the New I-64 reconstruction project finished in 2009, a number of low clearance overpasses spanned the freeway east into St. Louis. The initial guide sign for I-170 was mounted on the McKnight Road overpass. Photo taken by Brian Dowd (06/02). A Breezewood connection linked I-64 & U.S. 40 east with Interstate 170 north via Brentwood Boulevard (Exit 31) and Galleria Parkway. Photo taken 10/16/04. Page updated June 9, 2018.